The Carracci—Annibale, his brother Agostino, and their cousin Ludovico—are often credited with initiating the first phase of Baroque art. In reaction to the artificiality of Mannerism, the style that dominated central Italian art during the mid-sixteenth century, the Carracci advocated a return to greater naturalism. They founded a painting academy (Accademia degli Incamminati) in Bologna, Italy around 1580 that focused both on the study of the best artistic models of the Renaissance and on the direct study of nature. The Carracci developed a new style that blended the rich color, soft chiaroscuro, and warm lighting seen in the art of Northern Italian artists, like Titian and Correggio with the balanced compositions, firm drawing, and idealized forms that characterize the art of central Italian artists like Raphael and Michelangelo. Annibale further developed this style in Rome, where, with Christ Appearing to Saint Peter on the Appian Way, he created a work whose emotional immediacy signals the emergence of Baroque art. According to Catholic tradition, St. Peter and St. Paul were both executed in Rome around the year 67 C.E. during the reign of the infamous emperor Nero. The story (found in early Christian writings but not in the New Testament), states that Peter was freed from prison in Rome after he and Paul converted their jailers. Peter was then persuaded by fellow Christians who were concerned for his safety, to flee Rome. As he left, Peter encountered the resurrected Jesus. Astonished, Peter asked “Domine quo vadis?” (Lord, where are you going?). Jesus replied “I go to Rome to be crucified anew.” When he heard these words, Peter understood that his actions were cowardly and that he must return to Rome. There, he was arrested and crucified upside down at his request because he did not feel worthy of dying as Jesus had. In Christ Appearing to Saint Peter on the Appian Way, the two principle figures are set against the muted earth tones of the landscape, dotted with delicate trees and Roman architecture. 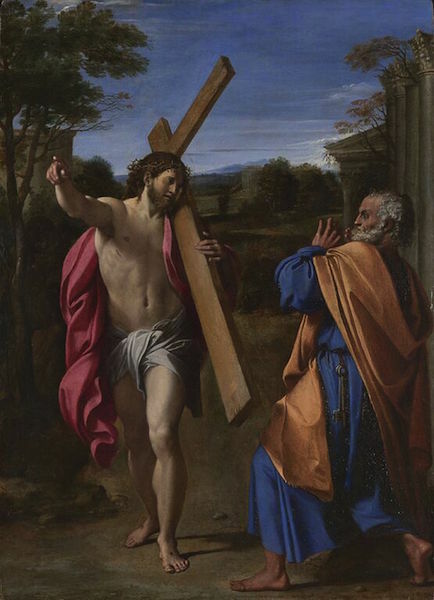 Initially Peter stood more erect and closer to Jesus, but Annibale modified his pose in order to more dramatically express his emotional reaction. Jesus appears in his resurrected body; it is muscular but bears the wounds of the crucifixion. He wears a white loin cloth and a red mantle over his shoulder (red symbolizes his humanity and the blood shed at his Passion). Other references to the passion are the crown of thorns on his head and the cross that he carries over his left shoulder. Peter is identified by his traditional blue and yellow robes, gray hair and beard, and the keys that hang at his waist (see below on why keys are Peter’s attribute). He is taken aback by the muscular figure of Jesus. Peter’s hands are up in a protective mode as he recoils in astonishment. While the Carracci advocated a return to Renaissance ideals of clarity and the direct study of nature (which they felt the Mannerist artists had rejected), this work is distinguished from the Renaissance in its psychological involvement of the viewer. Although Jesus turns his head to address Peter, he steps boldly forward toward the viewer as he points to his destination, which lies implicitly in front of the picture. Even the placement of the cross is expressive; one arm of the cross pierces the clear blue sky while the lower part projects out to the viewer. 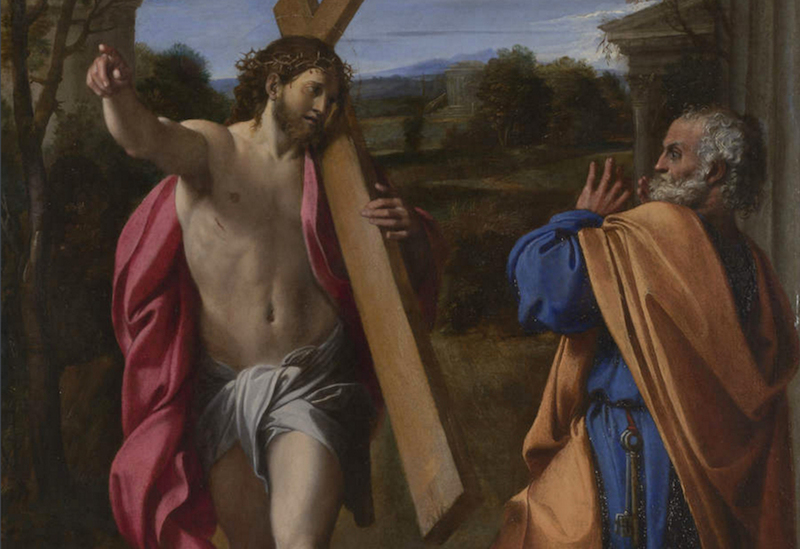 In these ways Annibale places the viewer directly in Jesus’s path and breaks the boundary between the painting and viewer’s space—engaging the viewer with an immediacy typical of Baroque art. Christ Appearing to Saint Peter on the Appian Way also depicts the most dramatic and expressive moment of the encounter. Peter is shocked and ashamed and Jesus’ physical strength reflects his moral strength as he strides forward confidently. The gestures and body language of the figures are posed at their most expressive—also anticipating the drama of Baroque art. The artistic renewal begun by the Carracci coincided with the spiritual renewal of the Catholic Church, known as the Counter-Reformation. thou art Peter, and it is upon this rock that I will build my church; and the gates of hell shall not prevail against it; and I will give to thee the keys of the kingdom of heaven; and whatever thou shalt bind on earth shall be bound in heaven; and whatever thou shalt loose on earth shall be loosed in heaven. 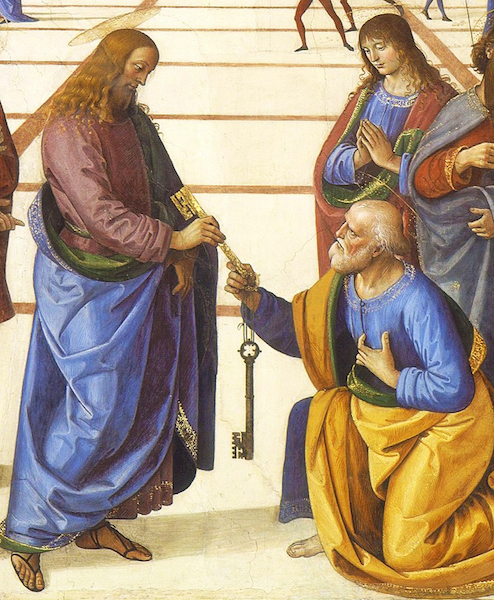 With the metaphor of the keys, Jesus was understood to have bestowed upon Peter the office of the Papacy and the authority to lead the Church. The Catholic Church considers St. Peter to be first bishop of Rome and, as such, the first pope. Annibale’s painting can be interpreted as a commentary on the authority of the papacy and the centrality of Rome as the headquarters of the Catholic Church. Many early Christians were martyred in Rome and St. Peter’s basilica was itself built over a crypt believed to contain the tomb of St. Peter. The painting was commissioned by Cardinal Pietro Aldobrandini (whose name saint was Saint Peter) when the Church was still heavily invested in affirming doctrines contested by the Protestants. With its emphasis on Jesus, Peter, and Rome, the painting reinforced the idea that Jesus himself had instituted the office of the Papacy (an idea refuted by Protestants) and that Peter was willing to die for the faith. Cite this page as: Dr. Melisa Palermo, "Annibale Carracci, Christ Appearing to Saint Peter on the Appian Way," in Smarthistory, November 29, 2015, accessed April 20, 2019, https://smarthistory.org/annibale-carracci-christ-appearing-to-saint-peter-on-the-appian-way/.